The 35X is a higher-powered and sought after version of the well-known 35, still with the superb Perkins 3 cylinder indirect injection A3.152 engine, but with around 44 hp, similar to a Massey 135. The tractor has the dual clutch / live PTO and diff lock. Engine was refurbed two or three years ago before I owned it - tinwork and paint is in good condition and headlights work, engine starts and runs well particularly when worked hard, as it often does on my flail mower (not included in sale). Injectors may benefit from a tune-up at some point. Working heat plug, dynamo fitted (not alternator) which charges the battery fine. Rear tyres good, front tyres also ok but would probably benefit from being replaced at some point. Hydraulics (3-point hitch) work fine, as does the PTO clutch. Tractor has reg number and V5 so fully road-ready. Has been used on road runs and at rallies and no problems to report. WIth the sale I also have an original replacement front steering tie rod joint from Ron Greet which could be installed to improve the'authentic' look, and also a dynamo cover (original) that could be fitted. Also, as pictured, a selection of important books - including the several-hundred pages parts manual. Will add a couple more photos shortly. Bank transfer or cash on collection only please. 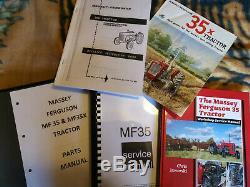 The item "Massey Ferguson 35X 1964 3 Cylinder Tractor fully working refurbed engine" is in sale since Monday, February 11, 2019. This item is in the category "Business, Office & Industrial\Agriculture/Farming\Tractors\Antique Tractors". The seller is "nickn5" and is located in Stourport-on-Severn. This item can't be shipped, the buyer must pick up the item.